January 2016 Blog Income Report - My Very First One! Home > Blogging Tips > January 2016 Blog Income Report – My Very First One! January 2016 Blog Income Report – My Very First One! I’ve been blogging for 10 years. My accountant knows how much I earn, obviously, since the blog is run through my company and I have to declare my profits and pay appropriate taxes. But apart from the very first few years, I haven’t focused on my earning at all. I’ve only used display advertising (such as Google Adsense and networks), and a few affiliate links to primarily Amazon. Apart from that, I’ve just been writing… for my visitors and with a view on search engine optimization. Easy Baby Life has around 10,000 visitors per day. I think that’s quite ok for someone who totally ignored social marketing or any marketing. It’s pretty much just the search engines and natural sharing on Facebook and Pinterest. But in January, one of the ad networks that I had been using since 2007 started delivering ad fill rates of less than 10%. That means more than 90% of my page views made me no money at all! I talked to them several times, but no improvements. So since this was one of my main income sources, I just had to do something. I started researching for alternatives and stumbled upon several blog income reports. Social networking… hadn’t done that either. So not only lazy, probably stupid too if I want to connect with readers (I do!!) and get more readers. Lazy, stupid and what more – yeah – cheap. I spend absolutely no money on good hosting, virtual assistants, great guest bloggers, social networking, you name it. I just collect the ad revenues I get and that’s it. I could do so much more and have so much more fun! And help more people out there at the same time! OK, so what do instead of just feel stupid? See the opportunities, of course! And do something about it! So as one of my steps to work in a more professional way and actually also contribute more to all moms out there, I’ve decided to start this new section of Easy Baby Life, where I will publish my income reports and other reflections and tips related to running this blog. This is new for me and a bit scary. Do you find it annoying? Out of place for a baby and parenting blog? I would understand that. In that case, just move on to other parts of Easy Baby Life – the vast majority of the material here will always be 100% focusing on caring for babies. But if you like what I do, have tips, thoughts, questions, comments, please leave a comment! I’d love to hear from you! OK, very long intro – here comes my first traffic and income report – tada! Grand totale – $772.46 Don’t laugh, OK? Maybe this sounds OK, but wait until you see my traffic numbers and RPM, that is, how much I earn per page view…. Here are some screenshots from Google Analytics to show my traffic for January 2016. 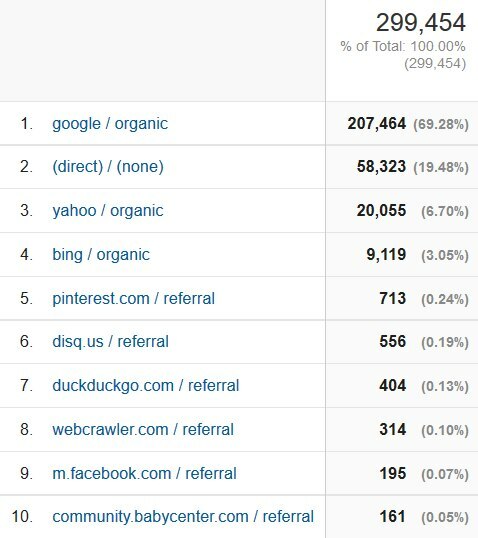 I think my traffic is OK but have a look at my traffic sources below. Social networks traffic is almost nothing! It is really mainly just google – and direct visitors, which I of course love, because it means people like to come back to my blog. 🙂 (Don’t get me wrong – I love my Google traffic too, but it shouldn’t be the only traffic source!) But one of my goals this year will be to connect to more visitors through sites like Pinterest, Twitter, Facebook and maybe others too. What can be said about this? I had no clue before starting write this post, how bad it was. I think many bloggers that focus at least a few percent of their time on revenues have an RPM of at least $5. Many earn a lot more. So the only way is up… right?